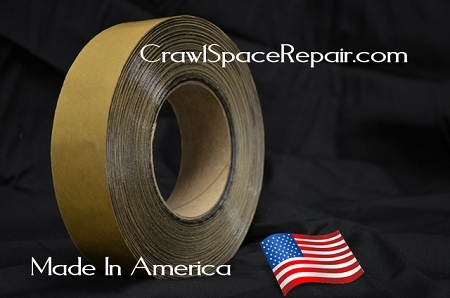 Foundation Seal Tape for Crawl Spaces- Made in the USA! Foundation Seal Tape (FST) is used to seal the vapor barrier to the foundation wall. When installed to a completely dry, clean (the concrete must be brushed off to remove loose debris- DO NOT USE A WIRE BRUSH- if the foundation is damp it will not stick well) foundation wall the bond is good enough to hold the vapor barrier to the wall temporarily (several hours/days) until the Foundation Pins are installed. If the foundation wall is wet in the area it will be installed and it will not bond then a polyurethane caulk must be used. This tape is 1.5" x 108' and has a reinforcement inside the tape to eliminate stretching like bubble gum. This is important because without the reinforcement this tape is impossible to apply in a crawl space. Most all other tapes on the market, similar to this one, do not have the reinforcement. Using a wire brush will create dust and debris that fills the pores of the block. When this happens the FST loses most of its grip to the block due to adhering to the dust in the pores rather than the block itself. No matter how much soft brushing you do AFTER the wire brush the FST will likely not stick. **During cold month installations this product must be stored indoors prior to use. This product is not meant for installations that have WET or very DAMP foundation walls please use the polyurethane caulk. * Product Update- As of March 21, 2012 we have made several performance improvements to our Foundation Seal Tape™. First- We improved the formula in making our FST™, it now has 10x's the bonding power of our original FST™. Our original formula did a great job, but our new formula shows our continued efforts in research and our commitment to lead this industry by developing the most advanced products available. Second- We improved the FST™ to adhere better to damp surfaces. Tests have shown the new formula can adhere to a "damp" surface, which is a major improvement. Since there are varying degrees of "damp" your results may vary. Third- We made the rolls lighter. When we increased the adhesion strength we were able to lighten the roll's weight and use less material. It created a balance between better performance and no increase in cost. Fourth- We made it longer. Because we could make the rolls lighter it gave us the option to add some length to the roll, therefore making an even better value. The new roll size is 1.5" x 108' instead of 100' in the old formula. Fifth- We work vary hard to make all of our products in the U.S. or Canada when possible. With some products it simply isn't, however the new FST™is now made in America. Investing in OUR country is as important to us as it is to you. The new FST™ is in stock and ships immediately. 6 rolls to a case. This tape was absolutely wonderful! It is very sticky and saved so much hassle for me doing this by myself! Great product!!! This tape worked awesome and adhered to the masonry blocks nicely. Very sicky! This is a must have if you are placing the plastic by yourself. I was able to put one end of the vapor barrier up and the tape held it in place, then crawled to the other side of the crawlspace, pulled the remaining plastic into place and adhered it to wall flush. It held tight until I was able to secure with permanent pins. Sticks well to concrete and poly sheeting. Save your money on this one. Unless your walls are really dry, this tape will not hold itself up much less the vapor barrier. Excellent quality and functionality. Competitively priced as well. However I asked it be shipped US Postal Svc but it came UPS at a stiff rate. Apply this 2 sided tape by hand sticking it without stretching it. Leave the outer backing paper on, then use a hand roller (J bar roller) to firmly press the tape onto the foundation. Roll the tape with the paper backing with hard pressure.. Then peel off the outer paper and place the vinyl fabric onto the exposed tape. Again use the J roller. Firmly roll the vinyl over the tape. Using the roller firmly and twice is a best-practice method. This tape will please you. Cut this tape with a knife. It quickly gums up scissors. Don't let the knife point puncture the vinyl. This tape works really well when installing an attic tent. It holds the tent in place until I can staple it to the framing. It also air seals the opening as well. Longer than necessary for 1 tent, but we install a couple dozen a year. It works great and no mess. This tape reminds me of the type of advise used in automotive, specificly to adhere the windshield to the frame. The tape sticks well to concrete but make sure you get it right the fist time as it is hard to remove from the plastic wrap and after pealing it from the concrete it won't stick well the second time. If I could make a recomondation I would suggest a wider backer than the tape membrane to ease the removal as it it very difficult to get an edge started. This was amazing tape. So far it still holds! (1 month out) Great for the application and didn't take us long to learn to handle and use it. Just a little practice. I had a really difficult time getting this to stick to the concrete. I brushed and cleaned the wall prior to applying the seam tape, but it did not want to stick. I ended up stapling the vapor barrier to the sill plate until I was able to get the pins installed. So, it appears the the concrete needs to be REALLY clean for this to be effective. We found there are too many variations in our stone wall for this to work. We instead used more pins at the top and then used adhesive caulking to seal the top. We only used three feet of this and are not sure what we can use this for, now? Any chance for a return/refund? We bought two rolls of this. The Foundation two-sided Seal Tape was much stronger than I expected (impressive). Sticks and holds to the foundation and vapor barrier plastic without pulling away - even if/when you accidentally pull the plastic too hard. I was surprised how well it stuck to the cinder block wall. Our crawl space was quite dusty before the liner was applied. It can be unforgiving if you need to pull the liner off the tape in order to smooth out wrinkles as you are moving along the wall. As indicated in the video only apply a small length of liner to the tape at any one time to minimize wrinkling of the liner. I say too sticky because this stuff is really sticky. If you stick it to the wall and don't start pealing off the top layer, it's a real pain in the neck. Before you stick it to the wall, start the top layer pealing off as well, then make a 'loop' and stick it back on so it's easy to get hold of when you are ready to start hanging your wall liner. Truth be told, it's not too sticky, but when it's stuck to your fingers, you may beg to differ. This tape was amazing and was easy to apply and held the 12mm encapsulation material with no problem. I did the project when I had time in the schedule and had to leave the job with only the tape holding the barrier for two weeks before I could install the foundation pins and it continued to stick and hold without failure. Great product! Owner, The Clean Air Co. This is a remarkable product. Best 2 sided tape I have ever used. You better put it in the right place the first time because once you put it on the block it it not going to come off. I brushed the block but the tape didn't stick well in some areas. The areas that did not stick well, I used the plastic pins, with caulk and it did a nice job. I cannot believe how well this tape holds. I used it to tape my vapor barrier to cement. The only warning is that it is so powerful that you don't get a second chance if you mess up. Anyway, this tape is well worth it. I just had my basement walls parged. The stucco is clean and dry but this tape would barely stick to it. It's a waste of money. Use the foundation pins and seal with the caulk instead. Great product, sticks well to concrete blocks, easy to apply, and along with the pins does a neat and professional job. If you have a crawl space, crawlspacerepair.com is the place to get the right products to do the job! Highly recommend the product and their expertise. The foundation blocks under my house my house are over 60 years old. Even after brushing them with the spacial brush these tape wouldn't stick. The caulk i ordered just in case did work but I will need to buy lots more. The tape was a WASTE OF TIME AND MONEY. I brushed the block but the tape never stuck. Was going to use the plastic pins with the tape. Instead I used the pins with caulk and everything went great. Tape worked great. Was easy to use . Made the job of sealing the sde walls of the foundation and the vapor barrier a breeze. This product has lived up to its reputation. Made the first purchase based on the reputation, and continue to purchase it based of satisfaction. This stuff is very sticky. So don't let it stick to itself. But when I installed my vapor barrier, the tape did not stay stuck to the block wall. You'll need to install Crawl Space Foundation pins as you go to keep it from falling. I will probably have use some polyurethane caulk to seal the top edge of my vapor barrier where the seal tape did not seal. This product works great. Absolutely essential if you are trying to affix the 12 mil barrier to a brick foundation in a space with 16 inch clearance. You have to be a contortionist. This product was strong enough to hold the plastic in place so I could belly crawl down the line. Because I had uneven brick to work with I had to go back through and put a foundation pin every 12 inches. It would not have been possible without this great product. Found all the products I have used from Crawl Space Repair to be high in quality along with fast shipping and packing. I tackled this job by myself and was still able to accomplish a great job when finished (although a little soar in the joints)and a little more time to finish.....lol. The foundation seal and waterproof seal tapes worked great and had a lot of holding power. I was impressed with the foundation tape as it stuck very well to the cinder blocks after lightly brushing them off. The foundation pins were easy to install and the 1/4 inch holes were surprisingly quick to drill in the cinder blocks. Makes for a neat job and extra holding power for over a longer period of time. The vapor barrier I used was the 12 mm and very strong and was amazingly easy to work with and lay down in sections,even on the walls of the crawl space. Now I have a crawl space that is well lighted and clean with less moisture content. I have even noticed some differences in the temperature of my house. It seems to stay cooler longer in the warmer temperatures,outside, we have been having,which means lower power bills. Been turning the air on in late afternoon and turning it back off in early evening and it stays a comfortable temp inside. We shall see what happens when summer temps come around,but it still should be an improvement. I used the foundation tape and it worked great! I swept the block with a broom and applied the tape. Then, I installed the pins. The job went smoothly with no issues. Good stuff. Makes the wall and piers much faster to work with. Works well, not as sticky as I would like, but works if plastic is clean with no dust. I'm sealing the crawl space on a new house under construction. I applied the tape and vinyl liner to the foundation walls prior to the wood floor system being installed. I made sure there wasn't any blobs of mortar in the way of the tape. The block was dry so the tape had good bonding strength. The excellent adhesive strength of the tape allowed me to install the tape along the entire wall section (60')and then hang the vinyl prior to drilling for the pins. Two days later I noticed the tape pulling away from the block in some of the corners. Since I had ordered extra foundation pins, I went back and installed pins closer in the corners as well as in between all of the original pins. Therefore, pins are every foot along the walls. I feel confident the vinyl will not come down now. I found in my damp crawlspace where my home is built on footings so the barrier had to be put directly on the inside of the bricks. The tape didn't stick to the moist brick. I've had to depend on the pins and caulking to seal the barrier to the interior crawlspace wall. It adhered well to the cement blocks though. Great tape!! Sticks to most surface types. If you have sprayed your walls with any chemical (termite treatment, etc.) the tape will not stick. You will need to clean the surface first. And you will need to keep a clean blade at all times to cut the tape.. I used this tape to encapsulate the piers in my crawl space. It stuck very well to the cinder block. I used 6 Mil plastic and it adhered perfectly. I was very pleased with the quality of materials and the relative ease of installation. You get high marks for quality, service, and an excellent website. This is probably the most useful product I used in redoing my crawlspace. It is excellent for hanging the vapor barrier on the crawlspace walls and floor piers. I have used for other applications as well. Extremely useful. The technique shown on the video for unpeeling the craft paper was great advice. Very impressive. I have recently purchase a 12 mil crawlspace membrane, the foundation tape, the waterproof seam tape and the pins. I was very impress with the quality of the products, the crawlspace of my chalet is now clean and no more smelling or humidity. As an general contractor this is the kind of product we are looking for, I have decided to offer the product to my own customer, this is definitely way much better that the 6 mil polyethylene that the CNB suggest we install in crawlspace. The membrane is very resistant and will last for years to come. Thanks for an awesome price. AndrÃ© Allaire General Contractor Vita Project inc. I was worried that it might not adhere so well because my foundation walls were not smooth but rippled in texture like Ruffles potato chips but it turned out OK and I had no problems hanging and securing the 12 mil to the walls. Foundation seal tape works great and performs as described. I would purchase this product again in needed. The foundation tape made the job easier than expected. The tape worked well on the foundation block but when applied to existing insulation styrofoam sheeting it peeled off rather easily, but because the tape was a temporary thing, it wasn't an issue. The permanent application with the vinyl sheeting screwed to the block the tape didn't matter in the end. This is some really strong tape. If it touches the vapor barrier, it is easier to leave it than to pull it off. The tape works really well on clean center blocks as long as you only attach it to the block and do not pull it off. However if you have red brick, the dust in the brick covers the tape and it looses its adhesiveness. To cut, use heavy duty scissors and a razor to peal the brown paper from the tape. I used the tape and polyurethane caulk. I strongly recommend this product. Thick and gummy, good for sealing vapor barrier to concrete block. If concrete surface is pitted or irregular, however, I would recommend using polyurethane caulk instead. This foundation seal tape was outstanding. It sealed and held under tough conditions far better than I expected. I was most impressed with its thickness and it's holding power. I used a bit more than originally planned because I had several uneven surfaces to seal around. I used the tape to add thickness so the vapor barrier didn't have to be cut perfectly or stretched into small wall/support voids that needed to be sealed for my project. This tape and all other products purchased were exactly what was described and I am very happy with the entire purchase and experience. This tape is easy to dispense and cut. I use a utility knife to cut and then lift the backing off of it. Be sure to clean the block where the tape will go. you do need to press it down to get a good seal and stick. I used alot more than I expected. measure the door way and any other vertical obstruction where you will have to run this tape down the vertical. I had 2x4's nailed to my block where all the electrical wires ran down. used up 25ft right there.